The Bread of Life Food Pantry welcomes guests each Tuesday morning from 9:00 AM until noon. For more information, click here. East Goshen Mennonite Church is a community of Anabaptist Christians. This is not a brand of church or a denominational label as much as it is a movement of Jesus’ followers. We are Christians who understand our primary call is to be disciples of Jesus who live out the gospel in our everyday lives. Our vision challenges us to Passionately Follow Jesus, discovering Jesus’ practices of loving, inviting, equipping and living. We desire to love and look like Jesus in our world. When Jesus called the first disciples (Matt 4: 19) he offered an invitation ("Follow me...") and a promise of transformation ("I will make you..."). These words of Jesus contain the essential definition of what it means to be a disciple. The word "disciple" literally means "a follower." As followers of Jesus, we need to model our lives after his: do what he did, and practice what he practiced. At the end of the gospel of Matthew (28: 19), Jesus speaks to those who years before had responded to his call of “Come and follow”; but now, he tells them to “Go” (the invitation reversed) and “Make disciples” (the transformation passed on). Disciples making disciples is essential reproduction for the church, which is a growing edge for us. This vision of the church is about movement rather than an establishment fixed in perspective, practice, and place. If the church is a community of followers who are on the move with Jesus, then we must learn the way of Jesus so that we know the path to follow, and then we must follow with passionate abandon. Early in the New Testament we discover that Jesus was on a mission carried out through his attitude and actions of love. His love for others connected him to people at the point of their need: a woman at a well, a paralytic, a leper, a bleeding woman, a deaf man, a boy with a spirit, etc. Jesus connected with people by joining life with them (eating with them, hanging around and walking in their towns). 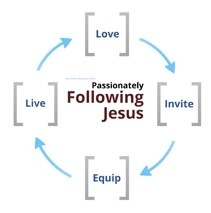 Jesus’ mission was one of constant invitation, from the blunt summons of “Come follow” to offering a sense of belonging to God’s family (Jn 1.12-13) and a place in the Kingdom (Lk 14.15-23). Jesus was masterful in offering the invitation to belong. Jesus’ time with his disciples was given to teaching, modeling the way of God’s Reign, and preparing them to go. The first disciples, regardless of their own understanding, were being spiritually formed and nurtured into the likeness of Jesus. Ephesians 4.11-12 speaks of Christ’s gifts of apostles, prophets, evangelists, pastors, and teachers for the equipping of the church. Just as Jesus lived in ways that were consistent with the Kingdom of God, he invited others to authentically embrace his way in full commitment of their everyday lives. Jesus sends his disciples to embody God’s passion for the world.